This is my maple tree. It sits on my front lawn. I've been watching it patiently for weeks waiting for its green leaves to turn some sorta different color. I woke up yesterday to this... whoa. 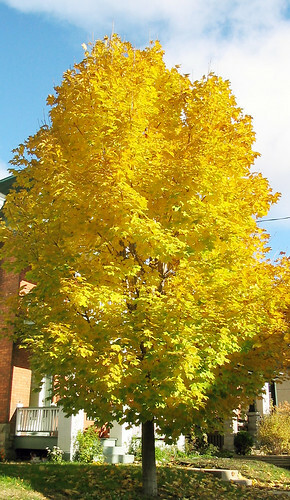 I'm very happy for this, this bright vibrant, happy changing tree. Minor work has begun downstairs. I did some floor mopping, some drainage pipe mapping, paint peeling, and smell searching tonite. I can't figure out this smell. At first glance it seems like its just must coming from the basement. But then i spend 5 min in the basement and come up and there it is again, in the kichen. Its definitely in the kitchen, i'm hoping it was residual dog pee on the floor and the mopping will ease it. I'm skeptical. It could be sewer gas coming from the sink, but i don't think so, its not that nasty nor localized... hmmm. The only thing i thought was the floor, so i'll have to wait and see. Any suggestions? ?